Based on the novella The Turn of the Screw by Henry James, The Innocents is the story of a troubled governess who watches over two children who are supposedly possessed as she believes the house is haunted. Directed by Jack Clayton and screenplay by William Archibald and Truman Capote with additional dialogue from Jack Mortimer, the film is a Gothic horror story set in a home that might be haunted. Starring Deborah Kerr, Michael Redgrave, Megs Jenkins, Peter Wyngarde, Martin Stephens, Pamela Franklin, Isla Cameron, and Clytie Jessop. The Innocents is an intoxicating yet eerie film from Jack Clayton. The film follows a woman who is given the job to be the governess for a man’s niece and nephew as her job is to care for them while he’s away on business as she becomes disturbed by their odd behavior as she believes the home they live in is haunted. It’s a film that explores a woman dealing with her situation as she tries to get to know as well as befriend these two kids living in this mansion which also house a few staff members include a housekeeper who probably knows more than she lets on. The film’s screenplay explores life at this beautiful and serene home that seems to be tranquil but there is also something off about the house once Miss Giddens (Deborah Kerr) has arrived into the home. In meeting the young girl Flora (Pamela Franklin) and the housekeeper Mrs. Grose (Megs Jenkins), Miss Giddens seems to have gotten herself a job that will make her happy and more. Yet, that all changes when Flora’s brother Miles (Martin Stephens) arrives after having been kicked out at school where things start off a little odd and then becomes more troubling due to Miles’ personality as someone who acts very mature and say a lot of mature things. Miss Giddens would then see mysterious people at the home thinking they’re alive as it is believed to be previous inhabitants in the home including the children’s previous governess. Miss Giddens would learn more about those previous inhabitants as she believes they are possessing the children as she wants to know what these inhabitants want. Jack Clayton’s direction is definitely stylish for many of the visuals that he creates as it help sets a mood into this massive estate and land which is a character in the film. Shot partially on location at a mansion in Sheffield Park on Sussex with much of it shot on Shepperton Studios in Britain. Clayton would use some wide shots to establish some of the locations but also use the wide shots for some unique compositions that play into some of the dramatic tension that looms throughout the film. Especially in the way he would frame his actors for a shot where there’s an extreme close-up of one character in the foreground and a medium shot of another character in the background. There are also some unique compositions in some of the medium and wide shots that would play into some of the things Miss Giddens would see during the course of the film as she wonders if it’s real or not. There are also sequences that are surreal as it relates to what Miss Giddens is dreaming about as it would also include moments that are very extreme as it relates to Miss Giddens’ relationship with Miles. While there’s scenes that are straightforward, it is only to build up the suspense as it would lead to this chilling climax as it relates to the previous inhabitants of the home. Overall, Clayton crafts an evocative yet haunting film about a governess dealing with children who could be possessed by ghosts. Cinematographer Freddie Francis does brilliant work with the film’s black-and-white photography to help create moods with its usage of lighting, shades, and shadows to play into the suspense and horror as well as the usage of candle lights for a few scenes set at night. Editor James Clark does excellent work with the editing with its approach to rhythms to build up the suspense and drama as well as the usage of superimposed dissolves to play up the dramatic suspense in a few scenes. Art director Wilfred Shingleton does amazing work with the look of the rooms inside the house as well as some of the things found in the mysterious attic as well as folly near the lake at the estate. Costume designer Sophie Devine, under the Motley pseudonym, does fantastic work with the look of the costumes as it plays into the film’s setting around the 19th Century with the dresses that Miss Giddens look to the clothes that the children wear. The sound work of Daphne Oram, with sound recordists Buster Ambler and John Cox, is incredible for the mixture of sounds in some scenes that add to the sense of terror as it is widely considered to be the early ideas of sound design as it’s one of the film’s major highlights. The film’s music by Georges Auric is superb for its orchestral score that is only used sparingly as it pops up on certain parts to help set the mood for the suspense and horror. The film’s marvelous cast include some notable small roles from Isla Cameron as the housemaid Anna, Clytie Jessop as the ghost of the previous governess in Miss Jessel, Peter Wyngarde as a mysterious ghost who seems to be haunting and possessing Miles, and Michael Redgrave in a terrific small role as Miles and Flora’s uncle who hires Miss Giddens to be the children’s new governess. Pamela Franklin is wonderful as Flora as a young girl who is full of life and energy though she is also odd for the fact that she sings a song from a music box as she has no idea where she knows the song. Martin Stephens is excellent as Miles as a young boy who is kicked out of school as he’s also full of wonderment but there’s also something about him that is dark as he would say things that would disturb Miss Giddens. Megs Jenkins is fantastic as Mrs. Grose as the housekeeper who is trying to understand what Miss Giddens is seeing as she also knows about the history of the house while aware that something isn’t right. Finally, there’s Deborah Kerr in a phenomenal performance as Miss Giddens as a governess who is hired to watch over the children of a rich man as she copes with the environment she’s in as well as the troubling behavior of the children as it’s one of Kerr’s finest performances. 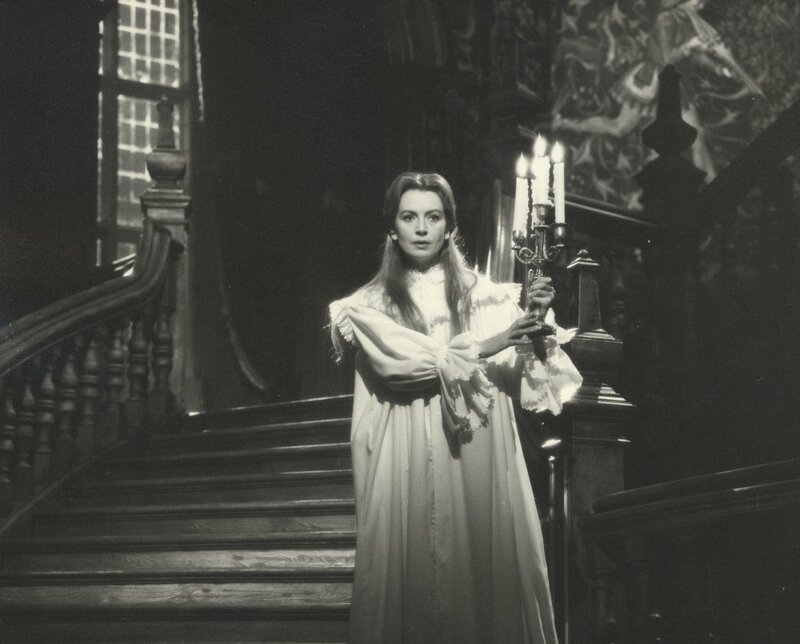 The Innocents is a spectacular film from Jack Clayton that features a tremendous performance from Deborah Kerr. Along with its gorgeous visuals, eerie music soundtrack and sound design, and a haunting story set in a haunted house. The film is definitely a horror film that is more about mood rather than cheap scares to create suspense as well as show what atmosphere can do to create scares. In the end, The Innocents is a sensational film from Jack Clayton. You nailed it with this review. A genuinely chilling psychological horror that keeps you guessing what is real and what isn't. @Brittani-See it. It's got a lot of elements that is lacking in today's horror films as well as its approach to sound and vision. @vinnieh-I'm glad someone else here enjoyed it. Man, there aren't a lot of horror films like this these days.